Almost everyone loves to save money. What makes it so satisfying? 2) It makes us feel good — like we “got one over” on “the man” (retail establishments, whose owners wouldn’t hesitate to gauge us). 3) It makes us feel savvy and fiscally wise. 4) Not everyone has money-saving knowledge, so it’s an acquired skill. If your radar beeps when you spot a “Sale” sign across a store, you’ve got it. If not, you can hone it. 5) It’s fun to swap money-saving tips with frugal friends (kinder than gossiping, too). “Hey, did you know who has the best prices on Cottonelle TP?” is a great way to share the wealth. And “Look at the cool clothes I got at the thrift store for $7!” is equally fun. The bottom line is, saving money makes us feel smart. And, of course, it improves our cash flow and lets us buy some little extras. Even die-hard bargain queens have a few things they’re willing to splurge on. What’s life all about if you can’t have a treat once in a while? What inspires you to be thrifty and seek bargains? Why is it so much fun to get a great deal? 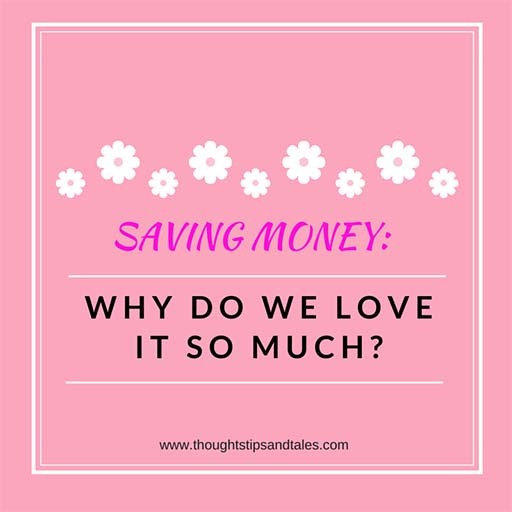 This entry was posted in bargain hunting, joy of saving money, saving money, why do we love saving money and tagged bargain hunting, joy of saving money, saving money, why do we love saving money. Bookmark the permalink. 2 Responses to Saving Money: Why Do We Love It So Much?